A few months after the conclusion of the ‘The Fly’ (1986), the son of Seth Brundle, the original human-fly hybrid, is born. Sadly, his mother Veronica, dies in childbirth and infant Martin is given over to Bartok Industries, the corporation that was originally funding Seth’s telepod research. Martin (Eric Stoltz) begins growing at an accelerated rate and is an adult at age 5. Realizing that Bartok intends to let him mutate completely, he tries to escape with his new found friend, Beth (Daphne Zuniga). Bartok agents find Martin completely enclosed in a huge amber cocoon, and bring him back, unaware of the horror they are about to unleash in their complex. I have fond memories of going to a midnight showing of this with my dad and a very enthusiastic audience. 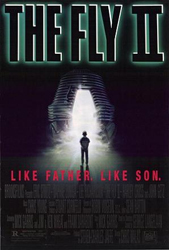 It’s a gleefully gross monster movie that serves as interesting counterpoint to the far more thoughtful and personal terror of Cronenberg’s 'The Fly.’ It’s not a perfect movie and it ventures a little too far into silliness but the effects are fantastic. The Martin Fly has a lot of personality and there is a fun visceral enjoyment in watching it take revenge on people so villainous they border on cartoonish. The final scene with the head of Bartok, Anton Bartok (Lee Richardson) actually comes across as quite chilling.